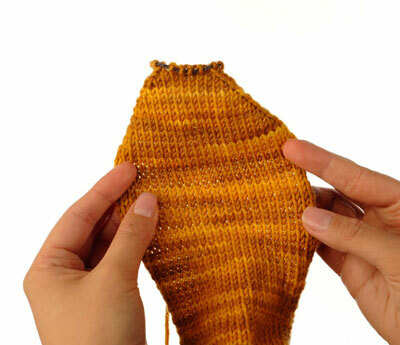 Once the gusset heel decreases or the short-row heel is complete, continue knitting the sole even in stockinette stitch. 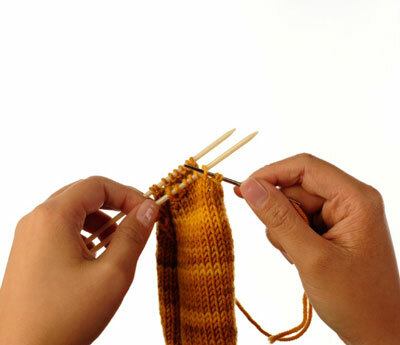 To finish the flat sock, you need to knit the foot and lower toe, sew up the sock and close the toe. Work the stitches for the foot even in stockinette stitch until the bottom of the foot matches the length of the instep to the beginning of the toe, or 2 inches less than the desired foot length. Shape the bottom of the toe as for the top of the toe. Place the remaining stitches on a stitch holder or waste yarn. 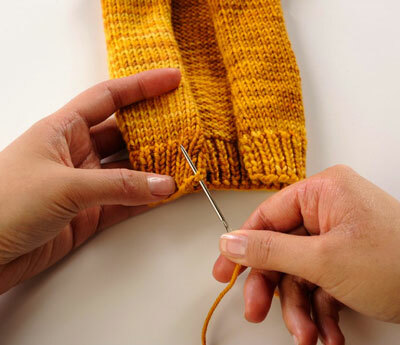 Once you finish the knitting, you need to sew up the sock into the proper shape, beginning with the seam at the back of the leg and continuing with the two foot seams. 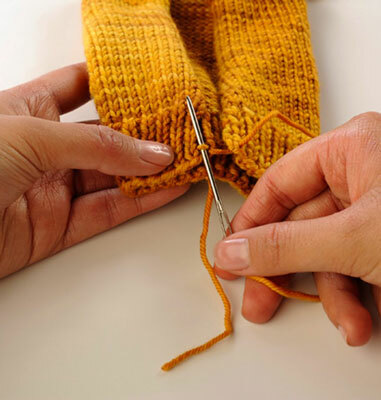 You will need a tapestry needle and a length of the sock yarn—or you can use doubled or thick sewing thread for a thinner seam (make sure your seaming yarn has the same washing instructions as your sock yarn). Mattress stitch creates an invisible, strong seam. Thread the yarn (or thread) through the tapestry needle. Hold the sock so that the cast-on edge is at the bottom and the right side is facing you, with the edges of the leg close together. Insert the tip of the tapestry needle above the cast-on stitch at the edge of the left piece, from underneath. Draw the yarn through, leaving several inches of tail. Insert the tip of the tapestry needle above the cast-on stitch at the edge of the right piece in the same manner, from underneath the work. Return the needle to the left piece and insert the tip of the needle under one bar that runs between the stitches, from bottom to top. Bring the needle to the right piece and insert the tip of the needle under two bars that run between the stitches, from bottom to top. Bring the needle to the left piece and insert the tip of the needle under two bars, from bottom to top. Continue to alternate between the two edges, inserting the needle tip under two bars each time. You do not need to pull the sewing yarn tight after each stitch. When you have completed about 1 inch of sewing, tug the sewing yarn to snug up the seam. The yarn should disappear between the stitches. Once you have completed the seam at the back of the leg, break the yarn and weave in the ends. Sew the two side seams of the foot in the same manner as for the back of the leg, working down the foot to the held stitches at the tip of the toe. You might want to graft the toe before completing the very end of the foot seams. You can close the toe of a flat sock the same way you close a top-down sock in the round. Grafting the toe stitches produces a straight, flat tip, while gathering the toe stitches creates a more rounded tip. 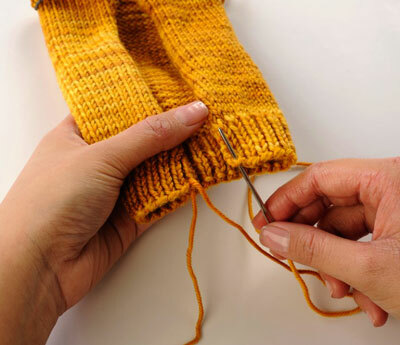 Return the held stitches of the top and bottom of the toe to working needles. 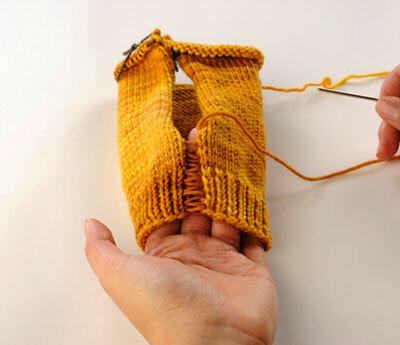 Graft the toe together with the Kitchener stitch. 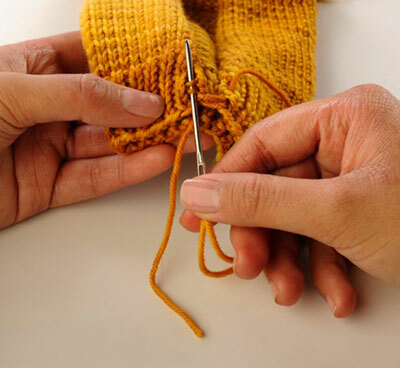 Return the held stitches of the top and bottom of the toe to a working needle. Thread a darning needle with a tail from the work. Work around the toe stitches, slipping each one purlwise onto the darning needle. 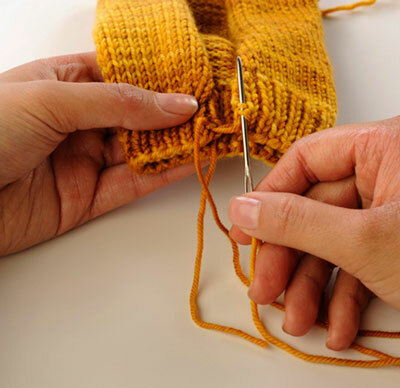 Once you have slipped all the toe stitches, bring the darning needle through all the stitches a second time in the same direction. 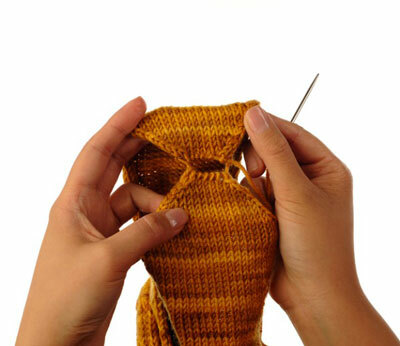 Pull the tail tight and bring the end to the inside of the sock.